Red Cross Wants Video Games To Get Real On War Crimes : All Tech Considered The organization is pushing to have war-themed games adhere to the Geneva Convention — at least to its main principles. Spokesman Bernard Barrett says the goal is to implement consequences for things like shooting civilians and torture. 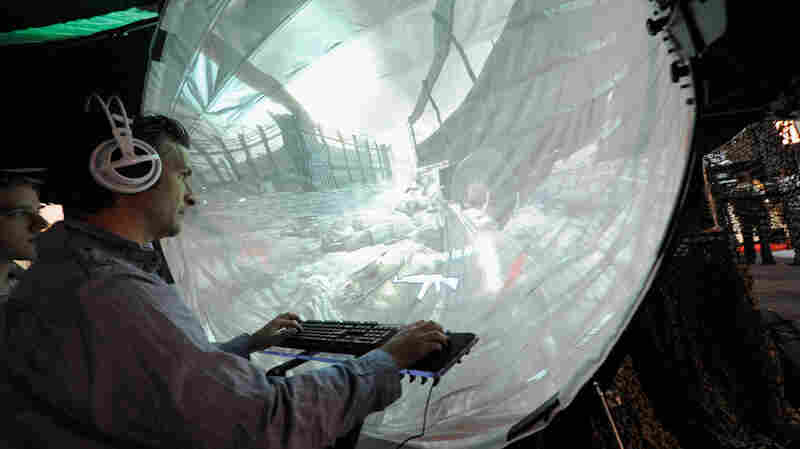 A gamer plays a war game at the Electronic Entertainment Expo in Los Angeles in June. The ICRC wants war games to spread understanding of the rules of armed conflict. There aren't universal laws of war when it comes to video games. Players can disregard the rules of the Geneva Convention without encountering any consequences. The International Committee of the Red Cross wants to change that. ICRC spokesman Bernard Barrett says that for the past two years, a special unit of the Red Cross has been working with video game producers to help them simulate real-world sanctions for virtual war crimes. As its website explains, "The ICRC is concerned that certain game scenarios could lead to a trivialization of serious violations of the law of armed conflict." "We're not going to get into the fine technicalities of the Geneva Conventions," Bennett tells Weekend Edition host Scott Simon, but the organization is focusing on things like deliberately killing civilians, shooting at ambulances and torture. Some games already do exact a price for such violations, he says: "In one game for example, at a company that we've worked with, if you start shooting indiscriminately at civilians, someone from your own side may start shooting at you." We've approached them, and in some cases they've approached us, asking for advice. In one case we said, "Hey, would you like to incorporate this in your game?" They thought it was a wonderful idea, so we sat down with them and explained some of the basic concerns and maybe some ways that they might want to approach it. It may reflect what happens in life. At the same time, because they are flouted, we can't throw up our hands and say it's useless, anything is allowable under war. We have to keep insisting on that, and we have to keep pushing the notion that there are laws, even in war, and that they must be respected. We know a lot of military off-duty play video games, and a lot of young men and women who are likely to be recruited play video games. And it's also a chance to sensitize the general public, so they can tell their leaders, whether they be military or political, that's not acceptable or that is acceptable.